Condition: Used Brokered item being sold on behalf of owner. Please request details. 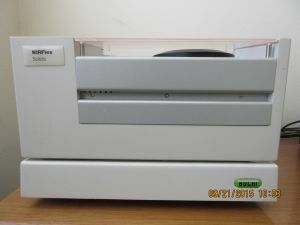 Product Description This 2009 Buchi NIRFlex N-500-200 (standard solids) FT-NIR spectrometer with NIRFlex solids is reportedly in excellent condition and is located in Oregon, should a potential buyer wish to go and see it set up and working. With its dedicated operator interchangeable measurement cells to accommodate many different sample types, the NIRFlex N-500 is a uniquely, flexible FT-NIR Spectrometer. Its Fourier Transform polarization technology guarantees the same superior performance across different environmental conditions; from laboratory to warehouse. The N-500 FT-NIR spectrometer provides reliable analysis results for quality control as well as research and development in the pharmaceutical, chemical, food, beverage and feed industry. The NIRFlex N-500 offers a wide range of measuring cells and accessories for highest performance. Includes computer loaded with NIRCal 5.2 Chemtronic software and NIRWare 1.2 NIR software suite, as well as operation manual. Also includes a set of glass petri dishes, transflectance cover for transflectance mode measurement, XL add-on for NIRFlex solid mode with iris aperture, XL add-on for NIRFlex solids accepting B+L caps, High performance sample cup for NIRFlex solids.